MONKEY SHINES: A Romero-esque Gesture Towards Mainstream Horror – Schlockmania! At the end of the 1980’s, George Romero found himself starting over again. After a decade-plus and several classic films together, he parted ways with producing partner Richard Rubinstein and his company Laurel to become a free agent. In what might be the strangest twist of his career, the lifelong independent filmmaker found himself making a couple of films released by a major Hollywood company, Orion Pictures. The first of these was a quirky “mad science meets Rear Window” item called Monkey Shines and it shows him playing the Hollywood game with his uniquely humane style of horror intact. 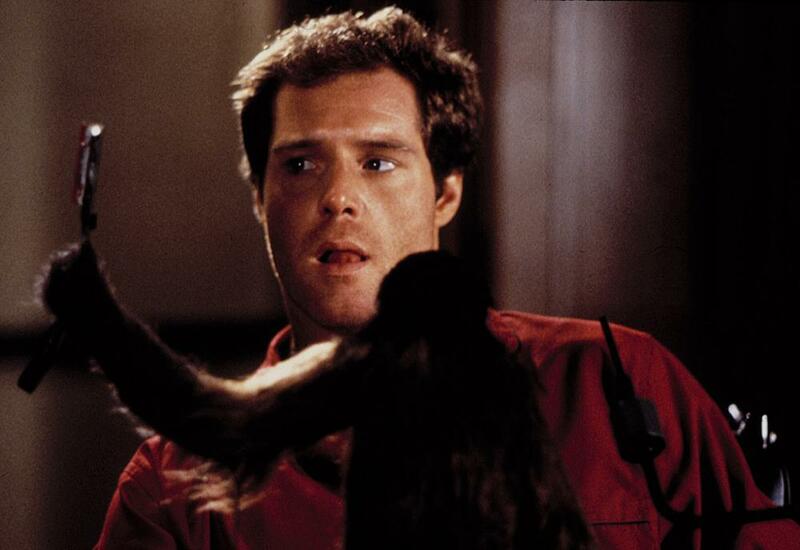 Monkey Shines takes its basis from a Michael Stewart novel, adapted for the screen by Romero himself, and tells the tale of Allan Mann (Jason Beghe), a promising law student whose life is suddenly derailed when he gets hit by a truck while jogging. He ends up a paraplegic and tries to fight off depression as he attempts to rebuild his life. A ray of hope shines through when scientist pal Geoffrey (John Pankow) puts him together with a program that trains capuchin monkeys to work as assistants to the disabled. Allan hits it off with his mini-simian friend and there’s even a cute trainer, Melanie (Kate McNeil), lurking in the wings. However, neither Allan nor Melanie know that Geoffrey provided the program with an unusual monkey. This monkey has been given an experimental formula derived from human brains and Geoffrey is hiding it out with Allan to keep it from an unscrupulous boss, Dean Burbage (Stephen Root). Soon, Allan finds himself prone to strange mood swings and strange dreams where he seems to be “seeing” through the monkey’s eyes. 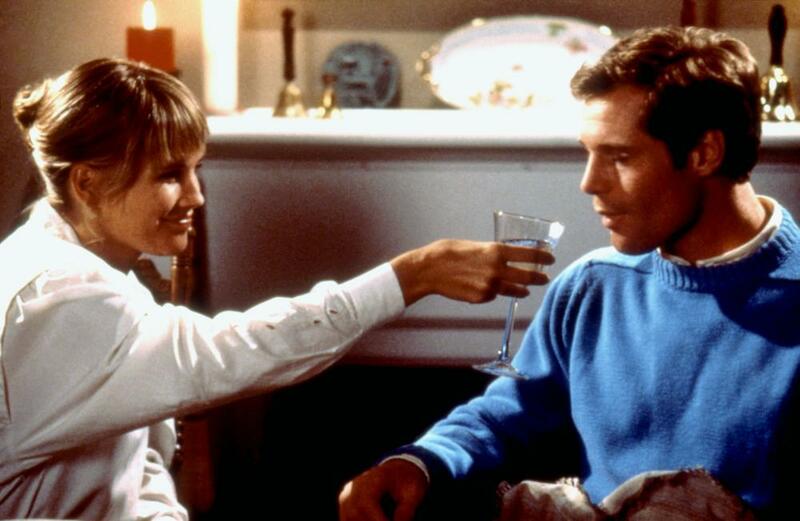 The highly intelligent monkey becomes very possessive towards Allan – and when Allan feels anger at those who turned their backs on him, strange accidents begin to occur. 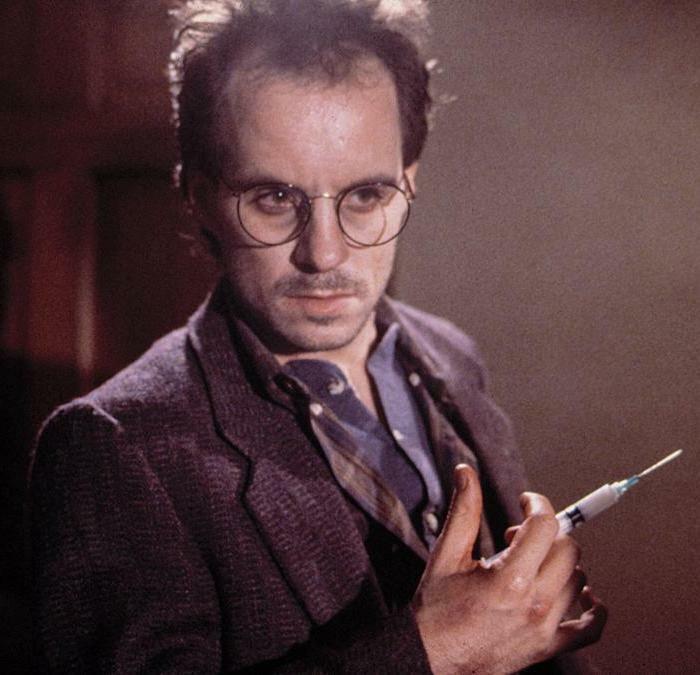 The plot of Monkey Shines is every bit as eccentric as it sounds but Romero smartly plays it straight, investing in more characterization than usual for a Hollywood horror flick of the ’80s to ground the plots strange turns (this applies to the leads, the peripheral characters are drawn a little more broadly). 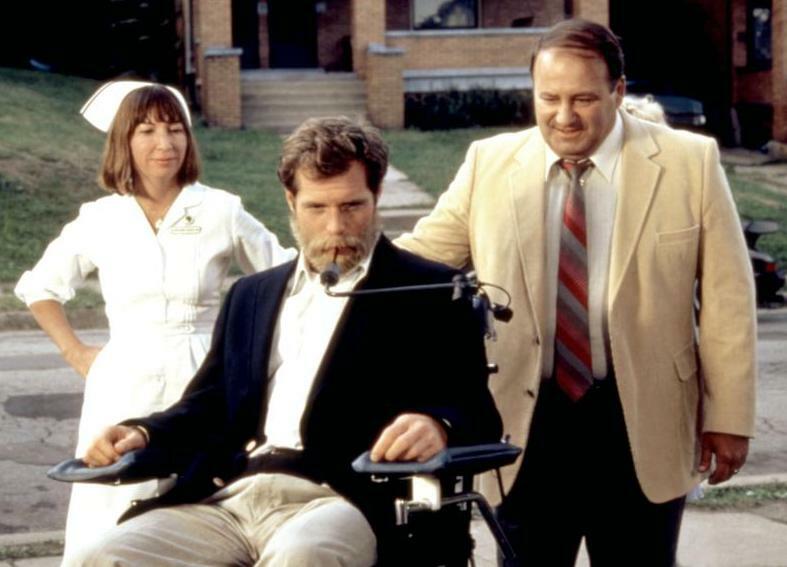 The result is a slow-burn affair but this pays off during a crackerjack final half-hour that functions as one big multi-level setpiece pitting Allan, with only a motorized wheelchair at his disposal, against his now-homicidal monkey. Strange as that might sound, it’s one of the b est setpieces in Romero’s storied career. Romero keeps the whole thing moving forward with a nice sense of polish that is achieved by a crew that mixes old faces with Hollywood pros. On the Romero vet side, there is nicely textured production design from Cletus Anderson and subtle yet sharp editing from Pasquale Buba, who really earns his stripes during that tense finale. On the Hollywood side, James A. Contner provides sleek cinematography that incorporates a few nifty tricks (wheelchair-mounted shots, “monkey’s eye” cam) and a lavish orchestral score by David Shire that is a far cry from Romero’s old library music sounds. 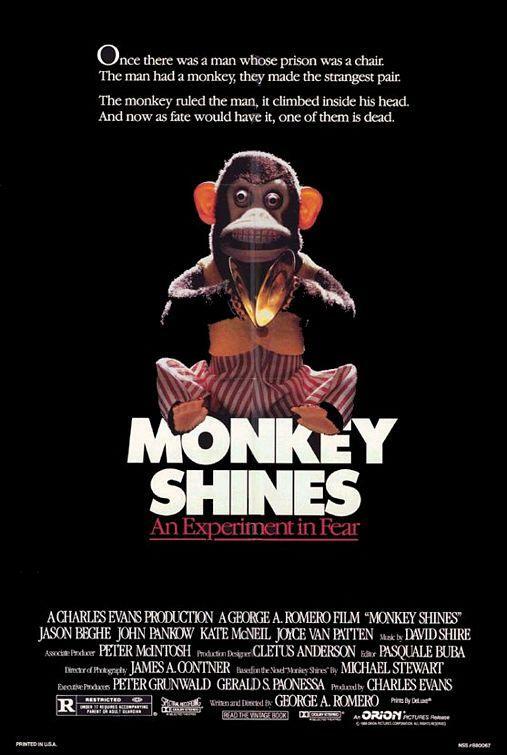 Monkey Shines is also aided nicely by one of the best casts that Romero ever worked with. Beghe does nice work in a very difficult role, relying on facial and vocal expressiveness to summon up complex layers of emotion since he can’t use his body for most of the film. MacNeil makes for a likeable, smart (and nicely understated) romantic interest while Pankow hams it up in an enjoyable way as the film’s resident mad scientist. Elsewhere, the backing cast is full of familiar faces on the way up: Stanley Tucci pops up as a duplicitous doctor, Elaine Turner is the unfaithful ex and Root has fun in a few brief scenes as Geoffrey’s cold-blooded boss. Romero fans will be happy to see Christine Romero pop up as an ill-tempered nurse who tangos with Allan and his little helper. In short, Monkey Shines is an interesting gesture towards the mainstream for Romero. The film suffers from a few blatant Hollywood touches – the victims are all set up as nasty “they’re asking for it” types and the studio-dictated ending feels kind of pat – but Romero’s willingness to take his time and build up dimensional leads serves him well. Besides, that all-stops-out finale demands to be seen by the director’s fans.